Almarai is a leading food and beverages manufacturer and distributor in the Middle East as of 2017. The company and its subsidiaries are active in the Middle East and the North Africa region through five categories which are Dairy, Bakery, Juice, Poultry and Infant Nutrition. The dairy and juice is marketed under the Almarai name. Bakery business is done through Western Bakeries Company Ltd under the brand name L'usine products.In terms of joint ventures, the company operate through Internaltional Dairy and Juice(IDJ) for dairy and juice products in Egypt and Jordan. For Bakery segment, they operate through Modern Food Industrie(MFI) under the brand name 7Days. The company has its headquarters in Riyadh, Saudi Arabia. 1. Market leader in Dairymarket in GCC: The Dairy Market has 5 product categories namely fresh milk, long-life milk, milk powder, laban and Zabadi. Dairy is the core segment of Almarai and it has grown from strength to strength in years making Almarai the market leader with a share of 35%. The closest competitors of Almarai in this market are Nestle and Al Safi with a market share of 7.6% and 7.4% respectively. Hence Almarai holds a strong grasp on the dairy market in the GCC. 2. High Quality products: Almarai maintains stringent quality measures and highest food safety standards at every step of supply chain. Complete ownership of supply chain helps them source their raw materials and other requirements in an efficient manner and ensure high quality standard. This efforts have made them one of the most trusted brands in terms of quality and reputation which can bee seen from the survey of YouGov. A BrandIndex survey conducted by YouGov named Almarai as Saudi Arabia’s top brand, the ranking was based on overall brandhealth taking into account the customers perception about the brands and their satisfaction with them. 3. Strong distribution network: Almarai’s Transport and logistic division is the largest in Middle East. They employ more than 3000 staff in transport, Warehousing, maintenance and planning departments across GCC in their Sales depots which are a total of 88 depots. This extensive infrastructure helps them deliver products to over 110,000 retailers across GCC. More than 8000 trucks deliver 2 billion kg of high quality products on time. 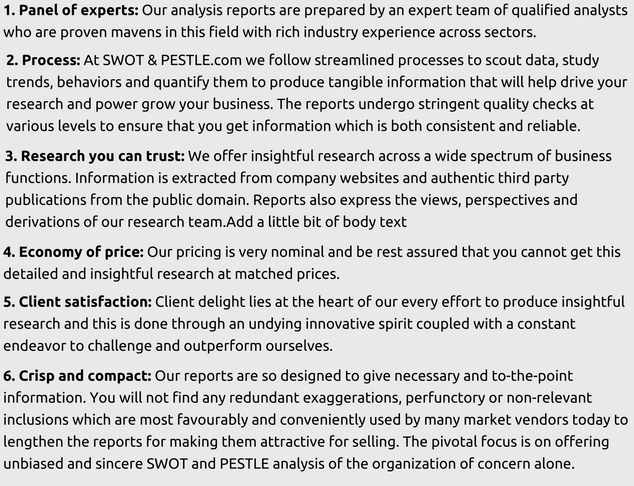 The remaining section is available only in the 'Complete Report' on purchase. 1. Political situation in the Gulf Region: Q3 earnings of Almarai took a beating with revenues down 4.5% than that of Q3 of 2016. The results are on the back of Saudi led blockade of Qatar which has entered into 2018. The blockade resulted in Almarai losing access to the Qatar market. Increasing tension in the Gulf region can prove to be detrimental to the sales of Almarai as more than a quarter of its revenue comes from the GCC. 2. Feedstock supply restriction will increase cost: Almarai will have to import all of its feedstock from 2019 as Saudi Arabia government has come up with a three year plan ending in 2018 to stop the production of the feedstock in the country as it being a high water needing cultivation and water scarcity is a major problem in the region. This decision added a cost of SAR 200 million in 2016 with cost rising each year till 2019. The company had to buy land in California to cultivate the necessary fodder for import. Any such changes in regulation can further increase Almarai’s costs. 1. Ongoing tension in the gulf region: The Saudi Arabia led blockade of Qatar that started in June 2017 has resulted in the loss of revenue for the Saudi based company. The blockade has resulted in loss of access to the Qatar market for Almarai. The company reported 4.5% lower revenue in the third quarter compared to 2016. More than a quarter of Almarai’s revenue comes from its Gulf neighbours. The standoff between the Gulf countries will adversely impact Almarai’s prospects. 2. Prise Controls by the Government: As major revenues are concentrated in Saudi Arabia, the company’s earnings will remain subject to government pricing regulation. Any change in the pricing will have to be in sync with the existing government pricing. By the end of 2015, the Saudi food and durg authority extended the expiry date of pasteurized milk from 5 to 7 days. The government had said that the previous decision had resulted in an annual loss of SAR 500 million even though the product was valid, hence the change. 1. High Investment in technology: Almarai has invested a lot in new technologies which are employed in their factories to improve production on a large scale. The transport and logistic division also has been updated with latest technological capabilities to ensure smooth flow of product. The employees are also trained through E-learning applications which results in cost- saving. They have carried on automation of warehouses, production lines and sales to lower the costs and increase capacity. 1. Change in regulatory laws and compliance: The Almarai is subjected to regulation under the GCC and in particular Saudi Arabia where it has major production plants.Change in the laws and regulation can severely affect the groups ability to operate and compete effectively. The prime example being the feedstock supply disruption due to Saudi Arabia’s regulation banning the production of feedstock by 2018 due to scarcity of water. This would result in Almarai having to import all its feedstock by 2019 which can result in increase in costs. 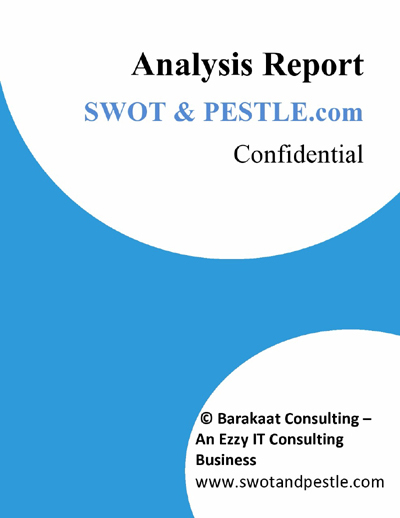 Almarai SWOT and PESTLE analysis has been conducted by Parth Ashar and reviewed by senior analysts from Barakaat Consulting. 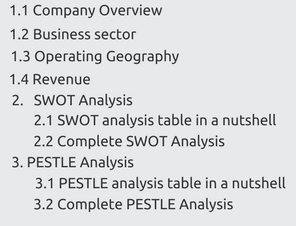 Copyright of Almarai SWOT and PESTLE Analysis is the property of Barakaat Consulting. Please refer to the Terms and Conditions and Disclaimer for usage guidelines.